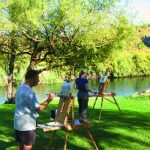 Painting outdoors has many benefits as well as many challenges. 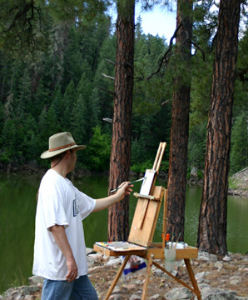 Below are six tips that will help you be successful as you plein air paint. 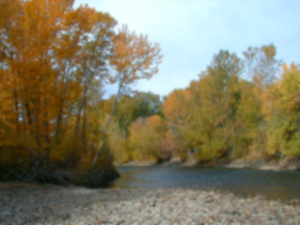 Practice these as you paint and you will improve your plein air painting. 1. 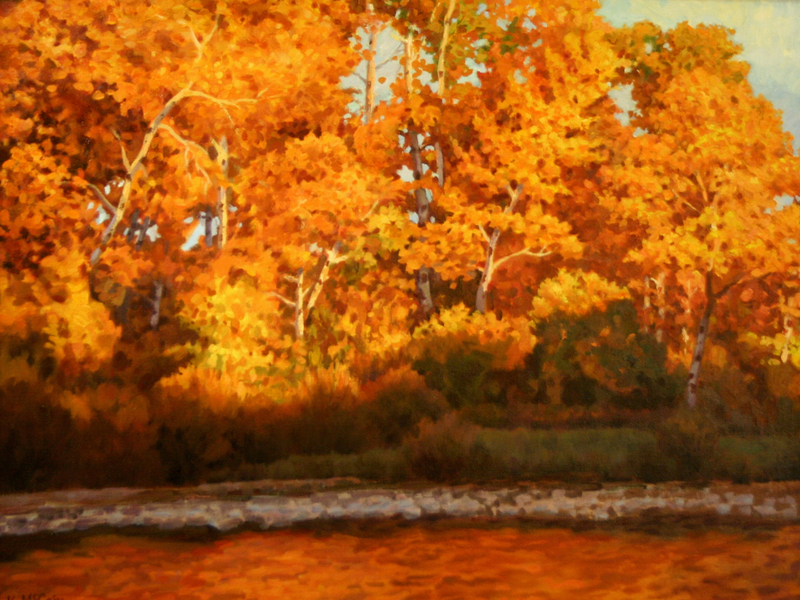 Simplify the Scene – With plein air painting it’s so overwhelming with all the detail of the outdoors. So look for the basic ideas of the scene basic shapes, size relationships and value relationships. Try to simplify the values to four or fewer for any one object. Don’t try to capture every little detail look for the large general shapes and larger families of smaller shapes not individual blades of grass or leaves that is just too much information. Below are a couple examples of simplified scenes. Notice clear they are even though they are very simple. 2. Blurring Your Vision to Simply – Squint your eyes to blur your vision. When you blur your vision it’s easier to see the main shapes and ignore the distracting details. Learning to simplify is vital to painting outdoors. Blurring your eyes to see the main shapes and value is the first step to learning to simplify. Below is pictured some photos that I loaded into a program and changed them to simplify the scenes. Even without a lot of details these are very powerful images. We want learn to do this for ourselves out in the field. Blurred scene to reduce detail. 3. Positive negative shape drawing – Using a sharpie or marker and a sketch book practice creating drawings using just black and white. This exercise will help you more than any other to learn to simplify shapes which will make your paintings stronger. Below is an example of drawings done in just black and white. 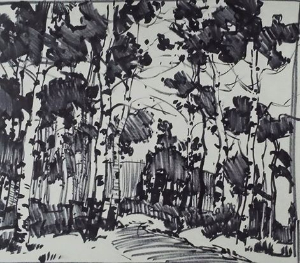 Below is a scene then the scene is forced into black and white along with a black and white sketch of Aspen trees. 4. Daylight is Bright Don’t Let it Overwhelm Your Paintings– Daylight is so strong that many times when you paint you think your painting is very bright and colorful but then you take the painting indoors and the painting turns dark and lifeless. This is because there is so much light outdoors even a cloudy day has 30% more light than a room indoors. Outdoor your paintings will look colorful and full of contrast. Inside the contrast fades as well as the intensity of the colors. To avoid this use an umbrella to shade your painting and color mixing palette. If you don’t have an umbrella set up your easel with your painting surface and color palette against the sun so it is in shadow. You need to bump up the the contrast in your painting and the brightness of the colors. 5. 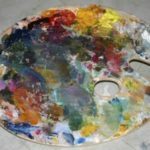 Keep Your Painting Small – Keeping your painting small will allow you to establish the values and color in your painting quickly. With the light constantly changing you need to establish the values and colors in about 30 minutes and then work the painting as needed. This is very challenging by itself. Keeping your canvas size small will allow to move quicker. So when you start painting outdoors keep you sizes small like 8” x 10” or 9” x 12”. As you get more comfortable painting you can increase the size of your canvases. 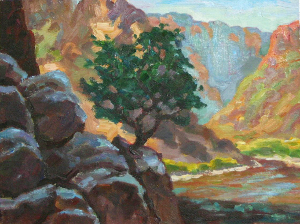 Below is one of small 12″ x 9 ” paintings I did at the Grand Canyon.